So, if you're a die-hard hands-on paper scrapper who just can't give up getting your hands and your scrap desk all messy, here's an idea for you to try something new: go HYBRID!! Give it a try (if you haven't) and you'll find it opens up a load of new creative possibilities, and saves you some time and money. I'll show you a few hybrid projects I did recently. 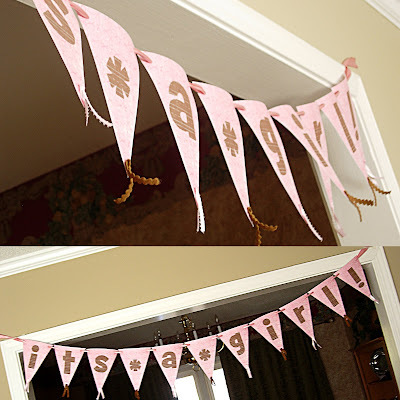 The first one is a baby shower banner. "So why not just make this with traditional scrapping paper?" you might ask. "Because you can save a lengthy step by adding the alphas digitally without having to spend hours cutting them out and gluing them on," I might answer. =) I'm all about simplifying, scrappy friends! I used a banner template by Angel Hartline (angelhartline.com), her Chocolate Strawberries Love Papers, and her Love Alphas (used as a clipping mask). I printed out the pennants on white cardstock (2 to a page), cropped them with my paper trimmer, stapled some scraps of ribbon to the points, punched two holes at the top, and threaded a length of ribbon through to hang it. So easy, and it turned out pretty cute! I did this hybrid layout for the Pub Ad Challenge over at 2 peas and it was a lot of fun and very easy to put together. The patterned paper and stickers are by Karen Foster Designs--got them in a prize package from the lovely Angie Lucas at Simple Scrapbooks. Wahoo! I created the crossword puzzle journaling in Photoshop CS2 and then printed it directly onto my kraft cardstock. 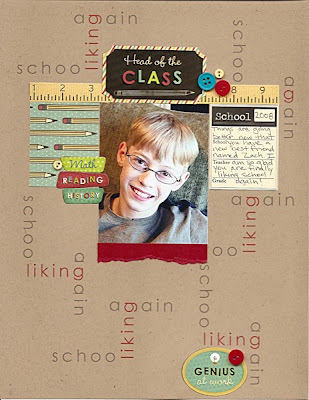 I also used 2 digital elements (ruler ribbon and school tag) from the Teacher's Pet kit by Natalie Malan for pcLayers.com. I printed those on white cardstock, cut them out, and used them just like I would any traditional element. "Why not just use traditional school-themed elements?" you might ask. "Because I didn't have any school-themed elements in my stash that fit with the look I was going for on this page." I might answer. I'm all about saving myself some cash and a trip to my LSS right now, scrappy friends! =) If you're worried about losing texture and dimension on your page, try mounting your digi elements with pop dots, or adding button, brads, ribbon, chipboard, etc. to make it pop off the page. You can do it...I know you can! Very cute banner and that layout is gorgeous Aly! I love doing it digi and paper combined... very fun techniques and limitless ideas!